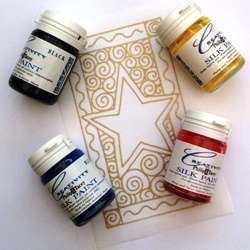 Christmas Shop > Christmas-themed Kits > "Between the Sheets"
Set of 4 iron-fix silk paints from Philip & Tacey, ideal for silk greetings cards or other small projects. Includes lemon, azure, red and black - ideal colours for mixing your own shades. The paints are water-based and intermixable, just iron the silk on the reverse to fix once dry.